← Will I break my altitude record? In a few weeks we’ll attack the first summit of the trip – Mera Peak. It is the highest trekking peak in Nepal with the height of 6476m. In the last post I described the route to our Mera Peak basecamp, which is not the usual Khare that is often used if only going for the Mera Peak, but a site on the other side of the Mera La, which is more convenient for us regarding how the trip continues afterwards. Here I’ll detail the route to the summit of Mera Peak. After acclimatizing at the basecamp, the route follows the same path back up to the Mera La and then diverges toward the peak. The glacier up there is getting more and more dangerous every year, but is still relatively safe to travel. The crevasses are few and rare. The route follows the snowy slope up till approximately 5800m where the Mera Peak high camp is located. There are a few options to choose from according to availability and preference. 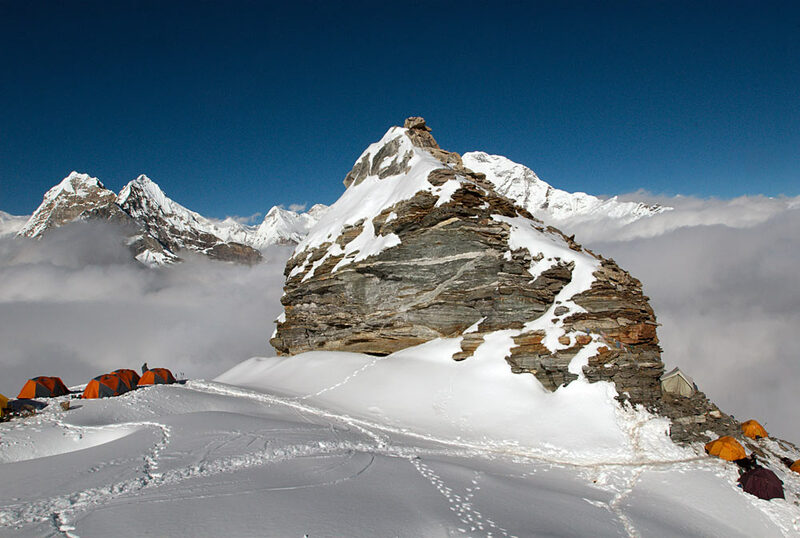 There are places right under a rock ledge or the rocky grounds around or you could pitch the tents on the glacier if that suites you the best. You can also play a bit with the elevation where you’ll stay to fit your acclimatization level. Walking the extra 50 or 100 meters up on the summit day does not really make the difference, but can make a difference on your sleeping quality. himalayas-trekking-pictures.com The Mera Peak high camp. The snowy camp on the left and the rocky camp on the right. Activus Outdoors The Mera Peak high camps rocky side can be quite rocky. Not much snow. The next morning around 2am we’ll start the ascend to the summit weather permitting. The route starts with a relatively steady snow slope almost all the way. There are some crevasses so roping up is not a bad idea. The upper part has a steeper section where the route passes the snow ridge from the left, but nothing particularly steep though. After that 1,5km plod the slope will even out again until the final summit cone. 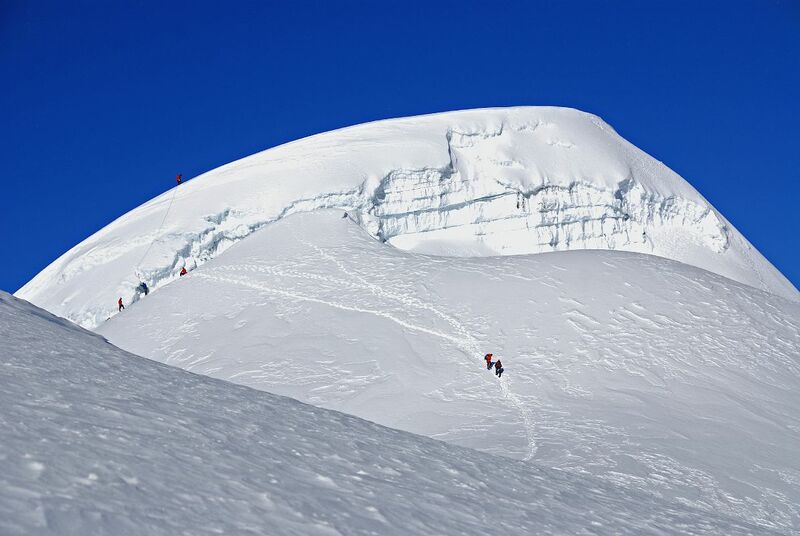 Many climbers climb the tad easier central summit, but the highest is the North summit with a bit steeper incline. For the final slope there are usually fixed ropes you’ll jumar up. Time to take the summit pictures and head down. 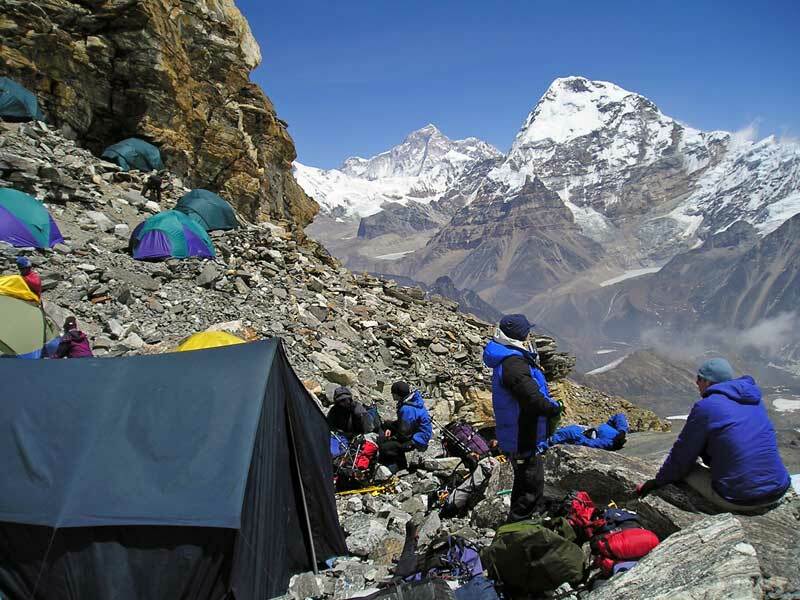 Usually it is descended all the way to the basecamp (Khare or to the East side of Mera La) the same day. This makes the day long and wearing. BruceB A panoramic view from the summit of Mera Peak to the North. Everest and Lhotse are back in the middle and Makalu is the high peak at the background on the right. Baruntse is the brownish peak at the background between these two. A classic summit pose from the top of Mera Peak. Everest is in the clouds above the head. If the weather causes trouble there is allotted a spare day for the summit push. If you get caught in bad weather, you might end up spending another night at the high camp or come back down to the basecamp and do your summit push from there. That would make the summit day even longer, but it can be done. Some years ago, up till the mid 90’s, the final summit block was much easier to climb. Now there are crevasses blocking the old “normal” route up and a steeper route via North has to be used. This has boosted the alpine grade of Mera Peak up a few notches. With this and also the lower slopes of Mera Peak getting more and more crevassed, it should not be taken as a granted peak. It has been mentioned, quite correctly, that the “trekking peak” status does not mean that you can trek as such all the way to the summit. You will need preparation and skills to go there. Although most of the hazards at Mera Peak come from the sheer altitude, you wouldn’t want to be the first to plunge into the crevasses on Mera Peak. It might make the headlines, but there are better ways to make them. 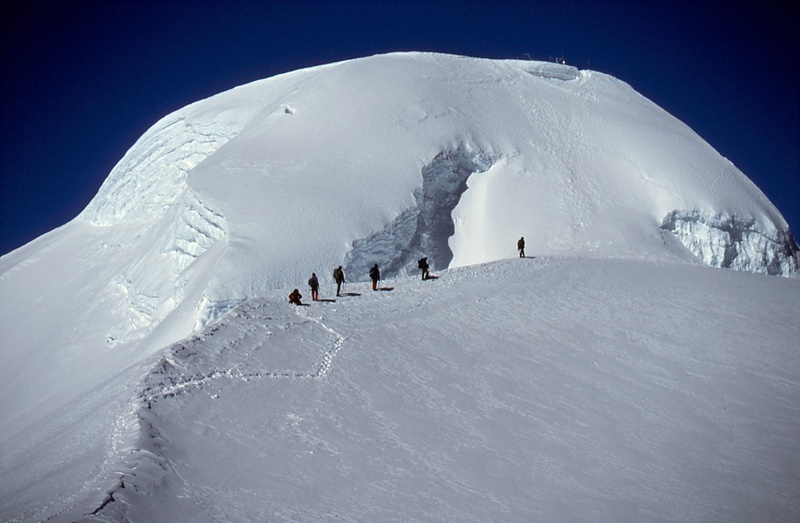 Nelson Mera Peak central summit cone in 1994. The old normal route is still very much accessible here. It goes straight up the snow slope. Jerome Ryan Mera Peak central summit cone in 2009. A huge crevasse blocks the way to the summit. The North route goes around on the right to the backside of the cone . So, the summit push ends back at the basecamp for some much desired rest. After reviving ourselves, we’ll start the trek towards the Baruntse basecamp at the end of the Hunku Valley. It will take another three days to get there along the uninhabited landscapes. Check that and the other parts of the journey from the Google Earth file[urldisplaymode=nomap] of the whole trip. If you like to read a more specific account on climbing Mera Peak, Mark Horrell has written a very detailed blog about it. Also you can watch Richard Pattison’s video about climbing Mera Peak on Youtube. 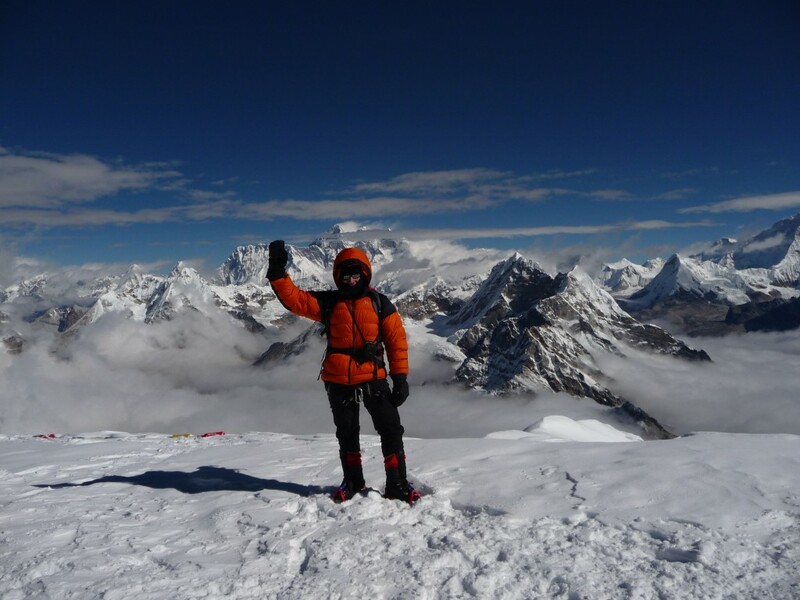 This entry was posted in Baruntse and tagged Basecamp, High camp, Mera La, Mera Peak, Pre-trip, Summit. Bookmark the permalink.